Stunning, South East facing, air-conditioned apartment ideally situated on the 3rd floor thus providing great views but not too high for vertigo sufferers. Directly overlooking the beautiful Estepona Marina with the local tapas bars and restaurants within an easy 5 minute walk. Access is provided to 2 swimming pools. Two E.C. Blue Flag beaches are an easy 5 minute walk away and Estepona old town with it's many beautiful tree lined plaza's is on the doorstep. The apartment has an open balcony, comfortably seating 4 people, providing panoramic views of Gibraltar, North Africa, the traditional white walled town and the lovely marina. Just perfect for people watching! The apartment is stunningly furnished having recently undergone a full refurbishment. It is comprehensively equipped with all you will need for a short break or long term stay. Our goal has been to provide a home from home for our guests, within one of the most beautiful, unspoiled and typically Spanish areas on the Costa del Sol. Between 1st October to 31st March all bookings of 4 weeks or more are discounted by 30%. Gibraltar: Only 35 minutes drive from Estepona (and on the local bus route), Gibraltar is a sunny, VAT-free haven where you can find duty free bargains from electronic equipment & jewellery to leather & perfumes & haggling is encouraged! Make sure you don't miss the spectacular natural caverns of St. Michael's Caves or visit the Ape's Den, home to some of Gibraltar's famous Barbary Apes, the only free-to-roam primates in Europe. Watch out for monkey business as they can be mischievous and have been known to pick the occasional pocket looking for treats. The Dolphin Trip from the Marina is an excellent day out and very rarely are dolphins not seen. Puerto Banus & Laguna Village: Puerto Banus is about 25 minutes drive away. It has a large number of designer stores including Versace and Armani. Perfect for millionaire spotting and you may also see a famous face or two in the port as a number of Hollywood stars have summer homes there. Laguna Village is a stunning high class shopping experience just 10 minutes drive away. Whether spending an extravagant day at the beach club, shopping in the designer stores or spending time in the luxurious bars and restaurants then Laguna Village is the ideal place. Selwo Safari Park: Only 20 minutes drive away and on the public transport route, Selwo is ideal for the perfect family day out. The park is based on an African safari park and houses 2000 animals from giraffes to panthers in semi-wild conditions. Like Jurassic Park, large open sided lorries drive you through the various animal enclosures and up into the hills above Estepona. There are elephants, bears, hippos and so much more to see. In the summer, cover up as it can get very hot and there is not much shelter. We have been holidaying in Estepona since 1992 and in 2009 we were lucky enough to be able to leave Manchester and spend more time in Spain. We have been letting guests stay in our apartments for over 10 years and like to think that we now know how to make our guests holidays a special experience; from the simple booking process, to providing detailed directions to the apartment, to the standard of the 'finish' of the apartments and the quality of the complementary welcome pack that we provide. It sounds easy but getting the little details just right is often the making of a stress free holiday. Puerto Paraiso is ideally located overlooking the lovely Estepona Marina and has views to die for! From watching the beautiful sun rise in the morning, to people watching throughout the day it is often hard to tear yourself away from the balcony, but you must, as Estepona has such a lot to offer both in and around the Marina and also in the 'old town' which is an excellent example of a sea-side pueblo blanco. The apartment is furnished with quality, modern and comfortable furniture and is well equipped with all you need to make this your holiday home from home. If you are in any doubt, refer to the review section; 10+ years of 5 star rating is difficult to argue with. A new bathroom has recently been fitted and it is light, airy and finished in marble for the extra touch of luxury. All towels are provided. All linen is provided with the exception of beach towels which can be purchased locally, quite cheaply. WiFi internet is included in the price. Beach towels are not provided but can be purchased locally, quite cheaply. The private parking area is only 50m away. UK TV is included in the price. Two residents only, salt water pools are available. To make the start of your holiday a little easier a complementary welcome pack including essential food items such as tea, coffee, milk, bread, water, wine, etc. is included in the price. Please ask if you have any additional requirements. Upon arrival, all facilities will be explained to you so you can relax immediately. The apartment includes a hair dryer with diffuser, a household iron and ironing board, TV including CD & DVD player (mp3 & iPod compatible) and a wide selection of English novels and board games. A children's cot can generally be made available at no extra cost - Please ask for availability. Access is also granted to two well maintained swimming pools which are exclusive to residents only. In the interests of all our guests smoking is not permitted within the apartment (smoke detectors are fitted!) although you may smoke on the balcony if you wish to do so. Just returned from our stay in this wonderful apartment. A bright and light apartment, the lounge is triple aspect and provides lovely views out across the marina as does the bathroom and bedroom. We loved sitting on the balcony and watching the activity on the marina but it was also great to be able to sleep well at night due to the excellent sound proofing once the windows were closed. We found the apartment to be well equipped providing that home from home experience. The extensive TV channel package (including UK) were great to have and the welcome pack on arrival was a nice touch. The apartment block felt very safe and secure and the pool area was swept and cleaned by the maintenance guys each day. There are two supermarkets within a few minutes walk and both the main beach and Cristo beach can be reached on foot within approx 10 minutes. Estepona Old town is approximately 15/20 minutes walk along the promenade, or the bus stop and taxi rank are literally across the road... giving you options. The booking process was straightforward and Andy was friendly, efficient and helpful in answering any queries as was Sue his contact in Estepona who met us on arrival. If you're looking for an apartment on the marina, whether travelling alone or as a couple then Andy's apartment in our opinion represents excellent value for money. Hi Julie, Thanks for taking the time to leave such a thorough and comprehensive review. We are really pleased that you liked the apartment so much and that you enjoyed Estepona. Hopefully we will see you again in the future. Regards, Andy, Beata & Sue. Recently stayed in Andy`s Estepona apartment for 11 nights. It`s a fantastic place to stay with everything we could have wished for to make our stay comfortable. A real home from home. Very clean and very well equipped. From the balcony, you can see the harbour and the sea. In fact this view can be seen from every window in the apartment. The location is spot on as there are 2 beaches 5 minutes away and there are plenty of bars and restaurants on the door step. Estepona itself is a great place to visit Thanks very much Andy for the complimentary welcome pack. Very much appreciated. I would highly recommend this apartment to anyone visiting Estepona and I would not hesitate booking again. Hi Marisa, Thanks for your lovely review. We are really pleased that you enjoyed your stay. Please let me know if you ever want to visit Estepona again as you would be more than welcome to stay with us again in the future! Andy & Beata. Clean, comfortable and secure. restaurants, bars, markets and beaches all very close. The apartment is exactly as advertised and is more like your own home than a holiday let. I really enjoyed my time there and would thoroughly recommend it. Hi Tony, Thanks for you review. I'm pleased that you enjoyed your stay. Regards, Andy & Beata. Loved the apartment, great location for the Marina and the local restaurants. An easy stroll to the old town or beach. Service from Andy was first class. Hope to be back to do it all again! Hi Doug, Thank you for your review. We look forward to seeing you again in the future. Regards, Andy & Beata. 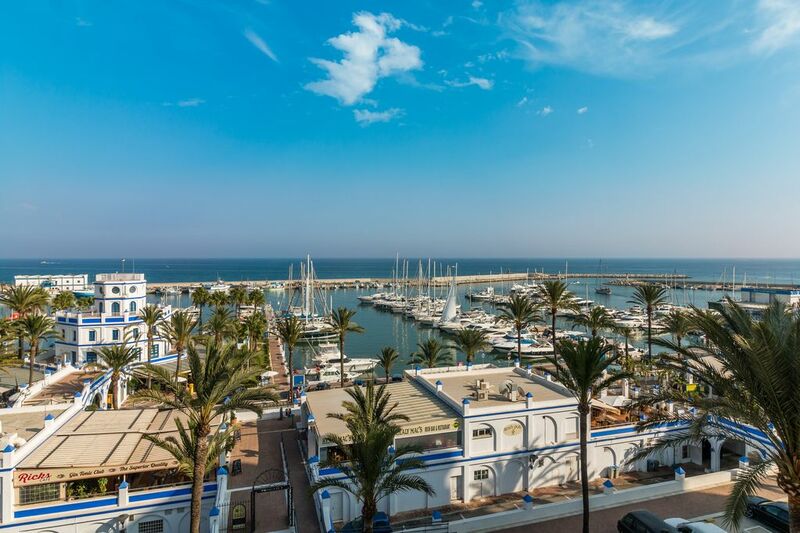 The Puerto Paraiso complex is ideally situated in the heart of Estepona's thriving marina with a wide array of restaurants and tapas bars giving the area a truly Spanish feel whilst pleasantly avoiding the 'night club' culture sometimes suffered on the Costa del Sol. Within 5 minutes walk you will find two supermarkets, local shops and beautiful beaches with E.C. Blue Flag status (awarded for cleanliness and safety). Our favourite, Cristo Beach, is a delightful oyster-shaped cove of sheltered, gently shelving sand, ideal for children and is only 5 minutes walk away (250m). In high season the beaches are manned by lifeguards and all have well maintained toilet and shower facilities and a choice of beachfront, traditional, Spanish restaurants (chiringuitos) making it ideal for a family day out. Estepona, due to its natural environment, surrounded by the sea and Sierra Bermeja mountains, enjoys its own micro climate providing over 325 days of sunshine per year and lovely mild winters. Other Activities: Chilling out in the sun with a cold drink and people watching!